Rhyming picture books are always firm favourites in Early Years settings. 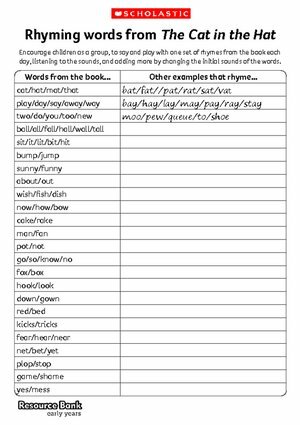 Take a look at these fantastic activities and resources for some great ideas for working rhyming fun into your weekly routines. One of the best-known pioneers of using rhyming text was Theodor Geisel Seuss who was born in Springfield, Massachusetts in 1904. His birthday is on 2nd March. 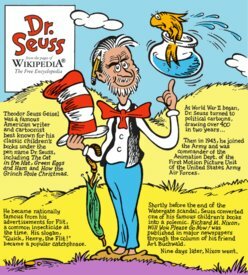 Known as Dr. Seuss, he wrote books for young children with an inimitable visual text, which is of immense help to the early reader and also great fun. He told the most ingenious stories of imaginative characters, well suited to the minds of children who are always prepared to accept and delight in fantasy creatures without questioning either their reality, or the improbability of the situation or setting. Dr. Seuss’s well-loved book The Cat in the Hat uses simple, high-frequency short words, which are repeated regularly throughout the book, creating an easy familiarity with the text. Read the book, discussing the illustrations and the various characters. Select small sections of the story asking children to listen carefully to hear which words sound the same. Then read again, emphasizing the rhyming words and asking the children to join in with you.